Image: An artist's impression of Curvo. “So much is said about global warming and air pollution. But experts often fail to focus on the crux of the matter. 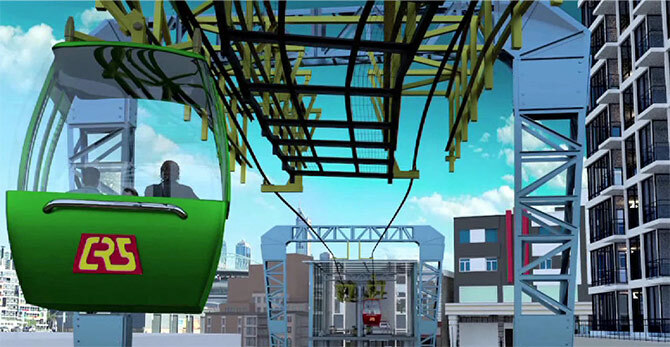 If we cut down on the number of fuel-driven vehicles and develop an alternative transportation system, we can do wonders,” says Shekhar Chakravarty, founder and managing director, Conveyor and Ropeway Services Pvt Ltd.
Chakravarty has developed and patented Curvo -- world’s first non-linear ropeway system. 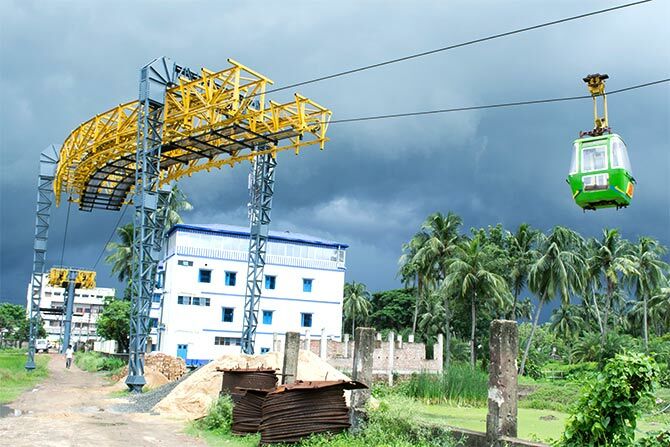 He is the managing director of Kolkata-based Conveyor and Ropeway Services Pvt Ltd, a company which has built a prototype of Curvo that runs along two angular deviations for about 250 metres around Bhasa near Joka in South 24 Parganas district. If everything goes right and West Bengal government approves CRS’ project, Curvo will start running in Kolkata soon. At the moment, the company is awaiting the transport department's nod to start the ropeway's commercial operations. For the time being, no one is allowed to ride the Curvo. According to company sources, Urban Development Minister and Kolkata Metropolitan Development Authority chairman Firhad Hakim, while inaugurating the prototype, had expressed eagerness to ride it but could not because of the same reason. In conversation with rediff.com’s Indrani Roy, octogenarian Chakravarty spoke about his company’s ambitious plans about Curvo, its usefulness and future among other issues. How did you conceive the idea of Curvo? Media these days is agog with reports of environmental pollution and its scary effects on health. Then there are reports of road accidents too every now and then. Why doesn’t anyone go to the root of the problem, I thought. Image: The prototype of Curvo around Bhasa. Does the answer lie in inventing an alternative transport system? Having worked in Breco Ropeways Limited, UK, in the past, I had a first hand knowledge how linear ropeways functioned. I thought of tweaking the design slightly to manufacture non-linear ropeways that could connect any urban road. This is how Curvo was born. The other day, a television actress of Kolkata lost her ailing father as they were caught in a huge traffic jam on the way to the hospital. Once implemented, Curvo can act efficiently as air ambulances. What is so special about Curvo? What are its advantages? Curvo being adaptable and amenable to bends can follow any existing city routes. It can travel overhead without consuming or interfering with road space below and the vehicular traffic that plies on it. It is safe, fast, pollution free, both in terms of emission and noise. It runs on electricity and does not use organic fuel. In the first two phases, we plan to run the Curvo from Sealdah Station to Dalhousie and from Howrah to Nabanna, the new Secretariat, two of the most congested routes of Kolkata. Image: (From left to right) Shekhar Chakravarty (extreme left) with his daughter Rachana Mukherjee and Firhad Hakim at the inauguration of the Curvo prototype. Please tell us about Curvo’s modus operandi. Curvo will run on existing arterial and other roads on steel portal frames spaced at 90-100 metres supporting the ropes. It will require nominal ground space for stations and portal frames. It will have no interference with road spaces and vehicular traffic or with the pedestrian flow. It can travel at an average speed of 12.5 kilometre per hour irrespective of route alignment, thereby cutting down on commuting time, considerably. The Curvo will, on any designated route, provide boarding /deboarding facility at stations 750 metres apart. The stations will have elevators. On the cabins reaching a station, the doors will open automatically to facilitate boarding/deboarding. A study on Kolkata revealed a possible overhead Curvo capacity of more than 200,000 commuters per hour, through multitude routes, which could be equivalent to 3,000 bus load of passengers per hour. And 3,000 buses would, as a ball park estimate, consume around 5,000 litres of diesel per hour. Curvo is strong, pollution-free and one of the safest modes of transport. In fact, it is 100 times safer than other vehicles. Image: Cabins, with a capacity of 8/10 seats each, are planned to be spaced at 22/25 seconds interval. Did you face any technical challenges while building Curvo? Designing the road grip structure so that it fitted with horizontal support rollers was really difficult. But our team of engineers worked diligently round the clock and came up with a satisfactory design within a short period of time. 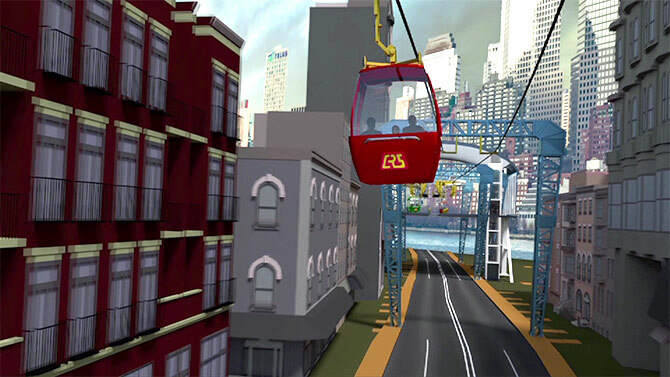 Why do you think ropeways are an essential part of urban transport and communication system? Power that Curvo consumes is not high at all. How many passengers can each cabin of Curvo accommodate? 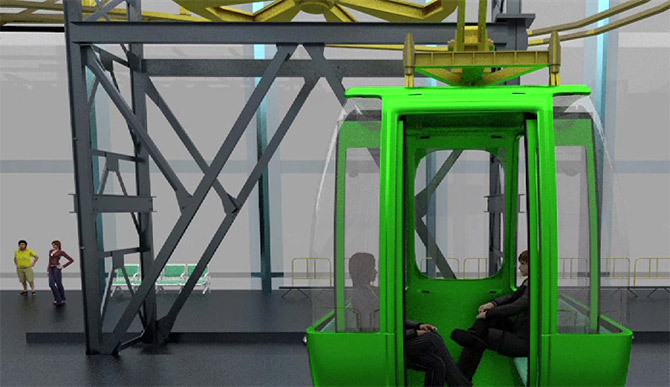 The Curvo ropeways can be so designed and augmented as to ferry 2,000/2,500 people per hour in each direction on a single track. Cabins, with a capacity of 8/10 seats each, are planned to be spaced at 22/25 seconds interval. A study on Kolkata revealed a possible overhead Curvo capacity of more than 200,000 commuters per hour, through multitude routes, which could be equivalent to 3000 bus load of passengers per hour. Estimated power consumption for running a Curvo system for one hour would be approximately at around 12 MW only. Terminal stations will be equipped with a drive or tensioning device. The entire Curvo ropeway shall be under constant close circuit television surveillance. What is the estimated budget for the project? The estimated cost of putting this system in operation will be Rs 20 crore (Rs 200 million) per km. It is one-tenth of that of the Kolkata Metro. We have spent Rs 10 crore (Rs 100 million) already over the last 5-7 years to design and develop CRSPL’s patented product in Joka. Image: An artist's impression of the terminal station of Curvo. Have you thought of a fair structure? Initially, we plan to keep the fare at Rs 10 each way for the Sealdah Station-Dalhousie route. How do you plan to finance this project? We expect the government to organise infrastructural fund. We are talking to our bankers and other financial institutions. We have held talks with Tatas of Jamshedpur and they have shown interest. We are in the process of writing to various organisations and individuals about this project. We are quite confident that once we get the state government’s nod, getting funds won’t be a problem. What is the status of your proposal with West Bengal government? We have submitted detailed project reports to the state government for two routes -- one between Sealdah Station and Dalhousie and the other one between Howrah Station and Nabanna, the new Secretariat. 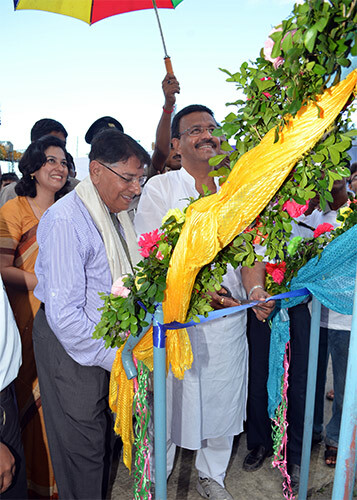 Image: Urban Development Minister and KMDA chairman Firhad Hakim (centre) inaugurating the Curvo’s prototype. 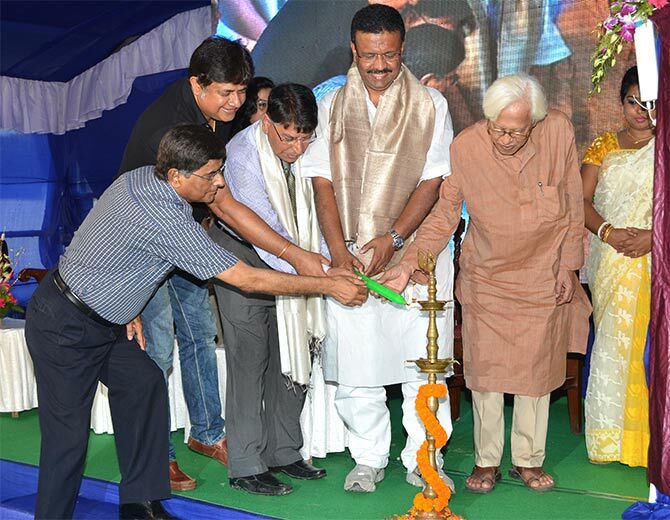 We invited the Central and state government officials to take part in the technology launch ceremony last year. We got encouraging feedback from the Urban Development Minister and KMDA chairman Firhad Hakim, who was present at the launch. We look up to Prime Minister Narendra Modi and his Cabinet too for support. When do you expect Curvo to be operational? We hope the project will get approved in a month or two and Kolkata will be home to world’s first non-linear ropeway in about six months. Do you plan to take Curvo to other cities? Yes. Bengaluru Metro officials are keen to talk to us about Curvo. We are going to meet them soon. Our company has a 40 per cent market share in India’s ropeway industry. We handle linear ropeway systems in several states of India, including Rajasthan, Madhya Pradesh, Chattisgarh, West Bengal (Darjeeling) etcetera. What about showcasing Curvo to the world? We do hope that this project finds a place on the global map soon. We plan to carry this invention of ours to international fairs. Since, pollution is a major issue all over the world now, Curvo is sure to draw the world’s attention. We hear that pollution level around London’s Buckingham Palace is four times more than the acceptable level in Europe. Therefore, we expect Curvo to strike a chord with United Kingdom as well as other European countries. Bangladesh too has shown interest in the Curvo-concept for use at its capital, Dhaka.